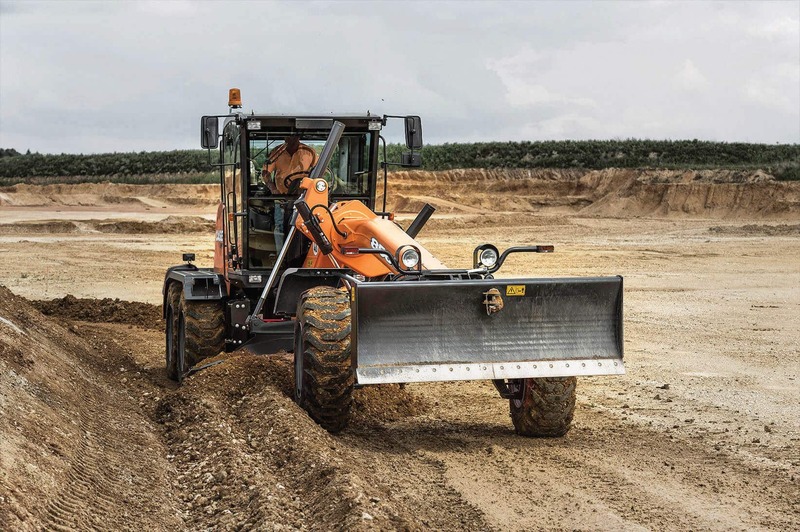 The mid-sized, 173-hp CASE 856C motor grader features one of the most intelligent, load-sensing hydraulic circuits on the market and an innovative moldboard design to provide reliable traction and balanced blade performance in challenging underfoot conditions, on slopes and with uneven load demands. 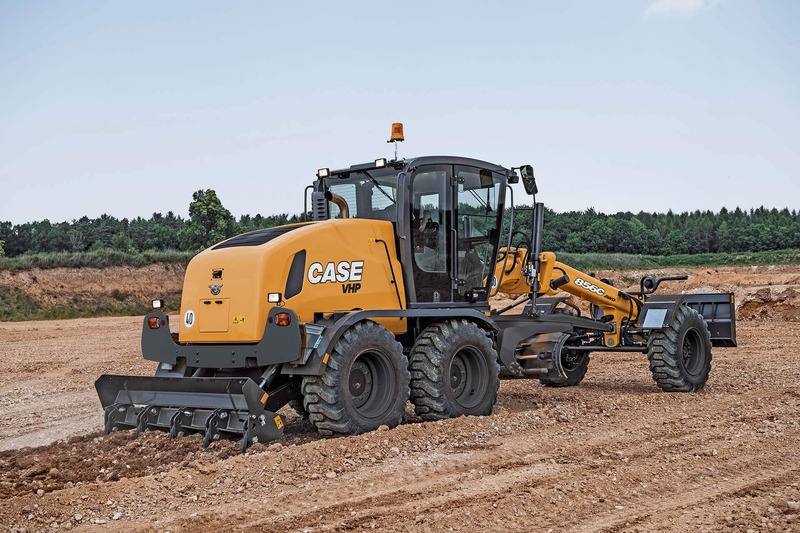 This Tier 4 Final grader is available machine control-ready for precision fleets, features a variety of intuitive controls to maximize productivity and comes standard with ProCare, the industry's most comprehensive machine support program. An Ergopower transmission provides smooth automatic shifting for steady performance regardless of acceleration/deceleration or grade. A 100-percent automatic differential lock with no-spin power splitting actively manages tractive effort and a high-flow floor switch enables operators to instantly maximize output whenever necessary. The exclusive, heavy-duty A-frame design provides superior stability and the moldboard tilts, pitches, moves laterally and is housed on a 5-position saddle to achieve bank-cutting angles of up to 112 degrees. Direct-mounted hydraulic controls reduce "play," giving operators positive feedback and better control during precision applications. Additional options include a front dozer blade, rear ripper, moldboard float feature and heavy-duty circle drive motor. C Series graders use a fuel-efficient, SCR-only solution (Selective Catalytic Reduction) to achieve Tier 4 Final compliance. There's no diesel particulate filter, meaning there's no regeneration, no associated temperature spikes or excessive fuel burn, and no additional replacement costs. Simply add DEF (diesel exhaust fluid) at fill-up and operate as normal. With a rear-mounted design that's positioned behind the articulating gooseneck and large floor-to-ceiling safety glass, operators have an excellent view of the moldboard and surrounding area at all times. A rearview camera with 7-inch LCD monitor and an advanced lighting package are also available to further improve jobsite visibility and safety. 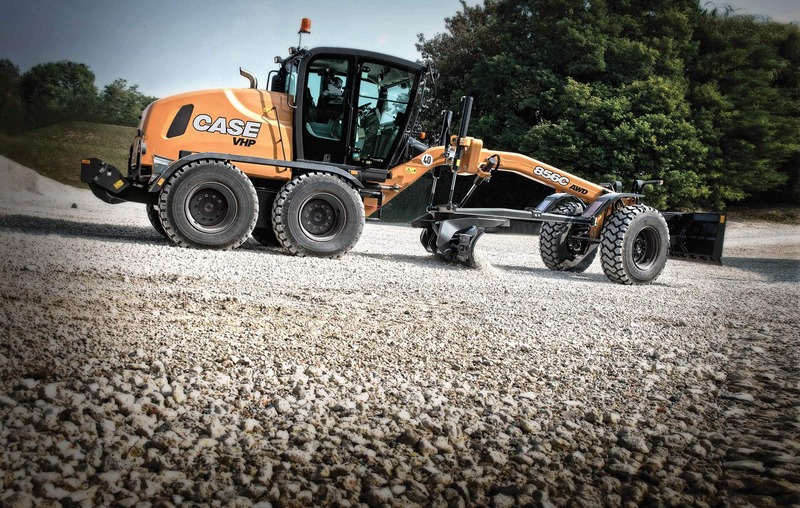 To keep operators comfortable, the standard ROPS/FOPS cab features a heated air-ride seat, adjustable control console, CD radio and sunshields. The 856C continues the CASE legacy of simple, accessible serviceability. The engine hood hydraulically flips up with the pull of a lever from inside the cab, providing easy access to key engine components from the catwalk. All checkpoints are located at ground or fender level to speed up daily maintenance and to save even more time, an automatic lubrication system is available. Plus, the standard protection of ProCare includes three years of planned maintenance. Hydrostatic front wheel drive D.C.V. Hour meter; Automatic trans indication; DEF/Ad blue level indication; Floating – if activated; FWD aggressive mode; Error prompt; Park brake message; Clutch engagement status; Vehicle moving – yes/ no; Engine speed; Travel speed; Current gear selection; FNR indication; Clock; Trip computer; Fuel consumption; Fuel level percentage; Oil pressure; Coolant temperature; Engine oil temperature; Transmission oil temperature; Hydraulic oil temperature; Turbocharger air temperature; Differential lock indicator; Gear selection indicator; Engine diagnostics; Transmission diagnostics; Keypad diagnostics; UCM diagnostics; Speed limit module; Support for different severities – White/Yellow/Red; System voltage; Error reporting; Warning prompts; Indicator warning lamps – main warning, parking brake, low brake pressure, low steering pressure, Pre-glow, high beams, turn signals, hazard lights, low fuel. Available in both standard and All Wheel Drive (AWD) configurations, the 836C and 856C are designed to maximize grading productivity and performance – all while meeting Tier 4 Final standards with Selective Catalytic Reduction (SCR) technology.